Modern football is very well acquainted with the spotlight of the camera. The World Cup Final 2014 was filmed by over 224 HD cameras, and that doesn’t even include the 14 roof cameras used to tell if the ball crossed the goal-line or not. The pristine hairstyles and garish boots we see every weekend are a consequence of this technological attention. Nowadays in the modern game no facial expression goes unnoticed, no blade of grass unseen, no mistake unrecorded. As a refreshing antidote to this development in football, we are bringing into the public domain the oldest piece of football footage in existence. It makes a contrast from the high definition shots that usually grace our TV screens, but the film provides an interesting insight into the nature of the sport in the late 19th Century, and is a clear example of how technology has evolved over the last 116 years. The footage was discovered in the archives of the North West Film Archive which is part of Manchester Metropolitan University. Although the film is not especially long or pristine, it gives an immediate sense of the atmosphere of football matches at the time. It should also make us all feel pretty grateful for the wonderfully crisp pictures we are lucky enough to watch each week. What is even more interesting about the film is the trivia behind it. Underneath is some information about the teams and about two notable players playing that day, who had amazingly interesting football careers. [Blackburn Rovers v West Bromwich Albion. Autumn 1898] from NWfilmarchive on Vimeo. The film depicts part of a First Division match between Blackburn Rovers and West Bromwich Albion at Ewood Park, which took place on the 24th September 1898. Blackburn are playing in pale blue and white halves (similar to the ones they wear today) and West Brom are in stripes. Blackburn won the game 4-1, with goals from Daniel Hurst, John Moreland and two from Thomas Jackson. West Brom’s scorer was Ben Garfield. Blackburn Rovers moved to Ewood Park in 1890 and still play there today, some 124 years later. The crowd for this match in 1898 was 12,000 strong, a stark improvement on the 4,000 who attended the same fixture the year before. The attendance for the most recent version of this fixture (in September 2011) was 22,909 and the stadium’s current capacity is 31,367. In 116 years these two teams have played each other 114 times – 57 times in Blackburn and 57 times in West Bromwich. The Rovers have won 41% of these fixtures, The Baggies 35% and 24% of the games have ended in a draw. On account of Blackburn’s relegation to the Championship (the second tier of English football) in 2012, the last time these two sides met was at The Hawthorns on the 7th of April 2012, where West Brom won 3-0. One of the most amazing aspects of this film is the history behind two of the players who started that day. West Bromwich Albion had Billy Bassett playing for them, a club legend who was included in the 100 Football League Legends list in 1998. Bassett was 29 at the time this video was shot and in his 13th and final season for the club. He played as a right winger and was renowned for his speed and agility - perhaps made possible thanks to his tiny 5 foot 5inch (165cm) frame. Bassett made 261 Football League appearances for West Brom, scoring 61 times in the process. He was also internationally capped; making his debut for England in 1888, at the age of only 19. He went on to boast an impressive goal-scoring record for England - scoring 8 goals in 16 games. 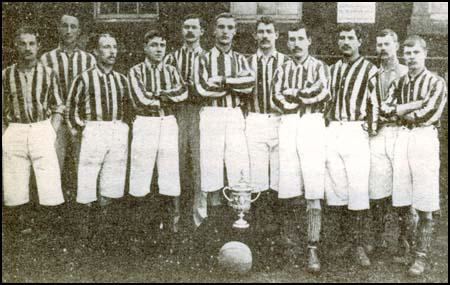 The 1892 FA Cup winning side with Billy Bassett (far left). It was the first FA Cup Final in which goal-nets were used. On a less impressive (but more hilarious) note, Bassett was the first ever West Bromwich Albion player to be sent off. In a friendly against Millwall, on April the 28th 1894, he was dismissed for using ‘unparliamentary language’ – an offence that nowadays would hardly be out of the ordinary. His final game for the club was equally uninspiring, as his side lost 7-1 away to Aston Villa. Talk about bowing out gracefully. In 1905, following the resignation of the entire board, Billy Bassett became an Albion director. Bassett, with help from Harry Keys, is said to have rescued the club from dissolution during this period, following various financial problems. Bassett became chairman in 1908 and in 1910 paid the players’ summer salaries out of his own pocket, so as to ensure the survival of the club. He died in 1937 and a two minute silence was held for him at Albion’s next game two days later. More than 100,000 people lined the streets of West Bromwich for his funeral procession. In the Blackburn line-up was a player of equal footballing importance, Bob Crompton, who went on to be dubbed ‘The greatest Rover of them all’. 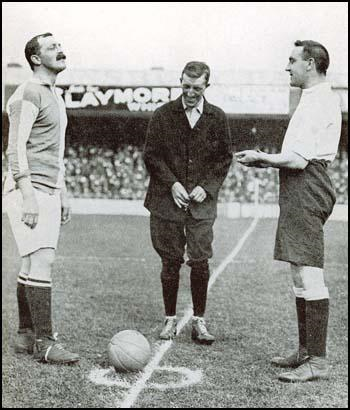 Bob Crompton (left) calling the toss in 1910. This film was made two days after his 19th birthday, and he went on to have a remarkably illustrious career, making 529 league appearances at full back. He is one of the most capped players in all of Blackburn’s history and he led the club to league championships both in 1912 and 1914. Crompton made his debut for England against Wales in 1902 and played more games in total for his country (41) than any player previously. He held this record until 1952, when it was surpassed by Billy Wright. He also received the highest honour by being asked to captain England – doing this on 22 separate occasions. His final competitive appearance was for Blackburn against Bradford, when he was 40 years and 150 days old, and he still holds the record for the oldest player to have ever played for Blackburn. After retiring, Crompton went on to manage Blackburn between 1926 and 1930, leading them to a FA Cup victory over Huddersfield Town in 1928. After a spell managing Bournemouth, he returned to coach Rovers in the late 1930s and guided them to the Second Division championship. On the 16th of March 1941, Bob Crompton was watching his side play against Burnley. As the final whistle was blown, signalling a triumphant 3-2 win for Blackburn, Crompton suffered a heart attack and collapsed. He was rushed to hospital straight away but tragically died later that evening. Born in Derby, 1864, Cheetham moved to Rhyl, Wales, in the 1880s and tried out a number of different professions, including printer, hygienist, phrenologist (a science based on measurements of the human skull!) and, finally, film exhibitor. He kept on making films until 1912 however his most active period seems to be around the years 1897-99, when he made over thirty short films. At least eight of these still survive today, including his iconic shot of children playing on Rhyl sands (1897) and his documentation of the minstrel show E.H Williams and his Merrie Men (1899). Cheetham took his films to the rural communities in the area and is responsible for the first-all-year-round cinema in Wales, established in Rhyl in 1906. Following this, he set up a cinema in Colwyn Bay in 1908. Arthur Cheetham died in Tring, Hertfordshire on 15 January 1937. He is considered to be one of the most prolific filmmakers of that early era and his work is often celebrated at Welsh film festivals, such as the 2007 Welsh Classic Film Festival and the 2009 Denbigh Film Festival. The film itself was donated to the North West Film Archive by Phillip Lloyd in 1987, who had been given the footage by one of Arthur Cheetham’s grandsons. Only around 40 feet of the film survived before it reached the archive and certain sections were missing. The original nitrate film was copied at the National Film Archive (now called the BFI National Archive) and a new 35mm master on safety film was returned to the North West Film Archive for preservation. We are incredibly thankful that this process took place, as otherwise we would not have been able to bring it to the attention of Football Addicts fans. The film, and the information that surrounds it, opens up a window into what football was like at the turn of the 19th century. The lives of Billy Bassett and Bob Crompton provide stories of two figures whose lives were defined by the sport and who gave everything in service to their clubs. It is through this short reel of footage that we remember just how expansive and romantic the story of football is, and just how much more history there is to be made. Making football a better sport. Together with Stonewall, Football Addicts created a poll in Forza Football about homosexuality in the sport.